The Philips Sonicare 3 Series plaque control is the most recommended Phillips Sonicare electric toothbrush. It offers you deep cleaning that most ordinary toothbrushes will struggle to match. What is in the Philips Sonicare 3 Series Box? Discount coupons which offers you savings on brush heads and other Phillips Sonicare products are also found in the box. This coupon is also acts as a warranty card. This warranty card gives you an opportunity to register your 3 Series toothbrush online. When you register online, you will be rewarded with an extra six months of warranty, making total warranty period of three and a half years. The Phillips Sonicare 3 Series gum health electric toothbrush works gently and effectively to improve your gum health by 10% better than a manual toothbrush. Bleeding and swollen gums can cause gingivitis and sometimes tooth loss. Sonicare 3 Series Vs 2 Series? The handle of the brush, could be easily mistaken with 2 series handle. Only slight different could be identified. The 3 Series handle equipped with three different speed indicators while 2 series had only two speeds which indicates through lights on the handle. The handle is the most active workhorse of the electric toothbrush. The motor causing the head to vibrate is located beneath the outer covering of the handle. You can initiate the action of the brush by turning the handle which is pressing the power button quickly. The button performs two actions – ON/OFF action and speed controlling action in cyclic manner. There is a hole at the bottom of the handle which prevents the brush sliding away from the charging base. Small plastic rod fits into the hole preventing it moving away. It has raised bumps which help to grip the brush firmly. The metal shaft at the edge of the brush onto which the brush head is attached simply by sliding the head through the shaft. A gentle touch is enough to remove the head. The brush head is the part which the 3 Series gets its name, “Gum Health” from. It is the softest available brush head under Phillips sonicare brand and is perfect for receding gums and sensitive teeth. Its shape is same as the shape of the 2 Series plaque control and the bristles are very smooth without damaging your gum. Combined with the ability to decrease the brushing intensity and end result is the gentle Sonicare Toothbrush you can . If you find the shape of the head is not fit into your mouth, you can change it with a more suitable head out of available nine Sonicare different brush heads which fits your mouth most. Brush head comes with a protective cap. It covers and protects the bristles when not in use and particularly helpful for those who store brush head out in the open on the bathroom counter. It also prevents your brush head from other outside particles such as hair sprays or deodorants. Change your brush head at least once in every three months. To remind you to change the head, check the dark blue indicator bristles. With constant using of the brush, these indicator bristles will fade and turn clear at around three months usage. The travel case first offered with the Philips Sonicare 3 series gum health. This travel case allows you to keep your brush safely and securely when you go on a picnic or vacation. Just as you buy the brush newly, there will be a strong plastic smell which fades off within a day. The case is available plain, and the complete white color helps to indicate the purity of your brush. This helps to prevent your gum andteeth infected with germs and impurities. The two vents on the bottom of the case facilitates ventilation even when the head is covered with the cap preventing mold and mildew from forming on brush heads that are still damp. Inside the case there is room for the 3 Series handle and two brush heads. The rechargeable battery which locates hidden inside the handle and when charging it needs to use charging base that comes in the box. The charging base is compatible with the majority of Phillips Sonicare electric toothbrushes. It makes you to carry only one charger with different Sonicare products. It is a small plastic box with a small rod sticking out of the top. The rod slides into the hole on the base of the 3 Series handle, holding it in position while charging, the hole prevents sliding away. to two minutes as prescribed by most dentists. is not sufficient, you can increase the duration by pressing the power button again back to on! As a conclusion, The 3 Series Sonic is an electric toothbrush provides you a smart way to clean your teeth without handling much but with electric movement. It brushes your teeth faster and efficiently rather than normal manual toothbrush. 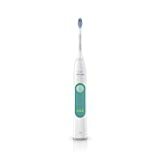 Using of the electric 3 series tooth brush gives you a very pleasant brushing experience. As you are using the brush for the first time, it gives you somewhat odd feeling but when you get used to it, you will find is more pleasant action. You can order online, as any other product. So if you are still using an old manual brush, it is time to change into a latest The Philips Sonicare 3 series plaque control electric toothbrush.